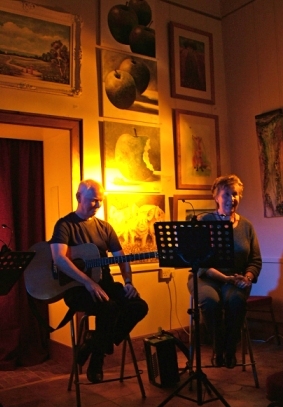 David John and Jean Illingworth have been involved in music all their lives, singing as a duo, and as part of different bands. "Our home and lives are always full of music, and we are privileged to know and perform with many wonderful local and national musicians and singers who are an inspiration. After moving to the East Riding and meeting several local musicians, we decided to hold a regular monthly acoustic night, as a community project and showcase for local performers.We hired the village hall at Kirkburn where we lived, and named the evenings ‘The Burn’. We brought in stage lighting and a PA, and with friends and neighbours, transformed the bare hall into a cosy atmospheric venue, that made everyone more relaxed. 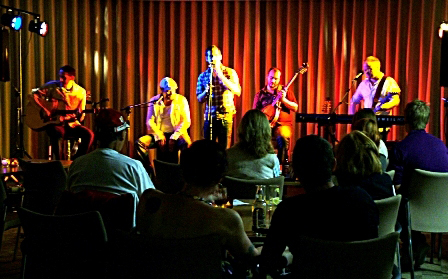 The music nights became extremely popular over the 5 years we ran them, w ith the evenings regularly made up of up to 18 different acts, from pop, jazz, opera, blues,classical, rock, comedy, the more eclectic the mix of acts the better, as long as it was primarily acoustic instruments. We had performers from 8 to 80, and a house band to support them if needed, and there was a family friendly atmosphere which was appreciated by a loyal audience. In 2007 ‘The Burn’ (later also known as Kirkburn Acoustic) won a prestigious award from The East Riding Council for ‘Enhancing the Social Well-being of the East Riding’. Along with Kirkburn Acoustic we ran 'Gallery Acoustic' a monthly open night at The Wolds Village, Bainton.We used the wonderful acoustics of their cosy art gallery, a lovely converted barn, (so no need for a PA system there). Here anyone could turn up on the night and get a floor spot of at least a couple of songs each. We ran that for 1½ years before moving to the coast. 'Gallery Acoustic' is now run by our friends the Appletons, and is usually on the 3rd Saturday of the month. The management of The Spa Bridlington approached us to run a regular acoustic night at the theatre, and we had our first ‘Acoustic @The Spa’ in April 2010 in the lovely ‘Harbour Suite’ with (as long as there was daylight) a panoramic window view looking out over of the sea as our stage backdrop. Here we did something a little different than our previous music nights, with one headlining professional act and only 2 or 3 short support acts."